Earth and environmental science postdoctoral research associate Jeremy Brossier presented a talk titled “Radiophysical Behaviors of Venus’ Plateaus and Volcanic Rises: Updated Assessment.” He also presented a poster titled “Complex Radar Emissivity Variations at Some Large Venusian Volcanoes,” on which Katie Toner ’20 was the first author. 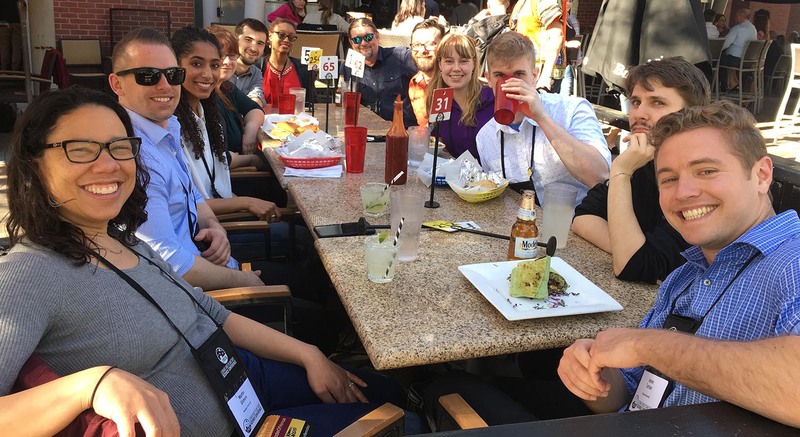 Two University faculty attended the conference: Martha “Marty” Gilmore, George I. Seney Professor of Geology and professor of earth and environmental sciences; and James Greenwood, assistant professor of earth and environmental sciences. Gilmore presented a talk titled “Variations in the Radiophysical Properties of Venus Tesserae: Could Be the Rocks? 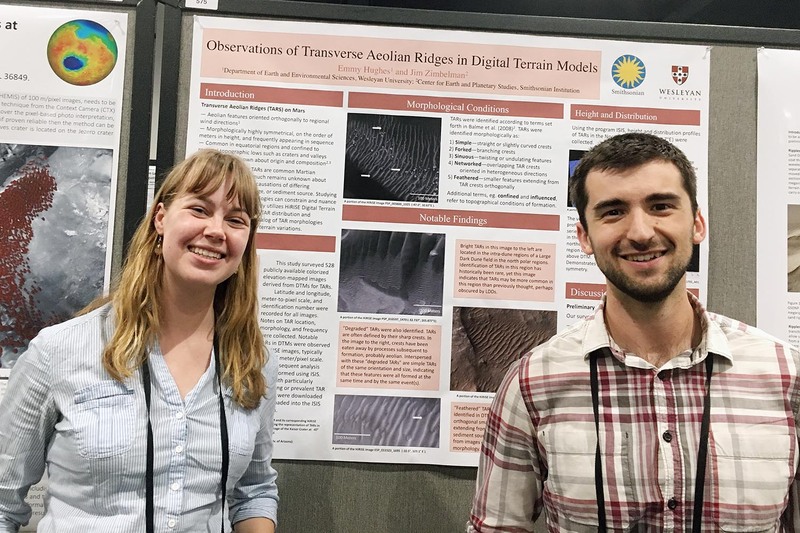 Could Be the Climate?” which focused on her work discerning and constraining variation of emissivity of ancient Venusian terrain called “tesserae,” and was coauthored by Nicole Zalewski ’20. 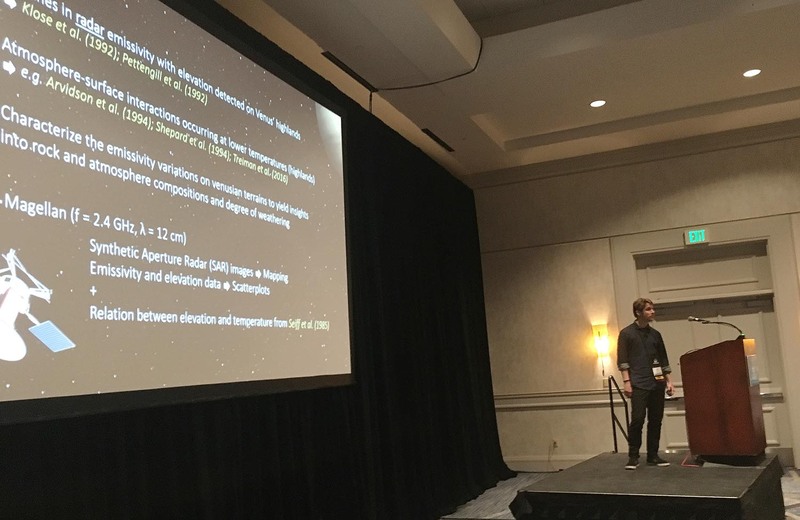 Greenwood spoke on “Hydrogen Isotopes, Volatiles, and Refractory Trace Element Compositions of Melt Inclusions and Apatite in a Consanguineous Suite of Apollo 12 Olivine Basalts,” which featured his research on hydrogen isotopes in lunar samples. Alumni in attendance included Ben McKeeby MA ’17, Jordyn-Marie Dudley MA ’18, Kristen Luchsinger MA ’17, Jesse Tarnas ’16, Peter Martin ’14, Miché Aaron ’14, Keenan Golder MA ’13, Nina Lanza MA ’06, Ian Garrick-Bethell ’02, Robert Nelson MA ’69, and Richard Ernst ’78. 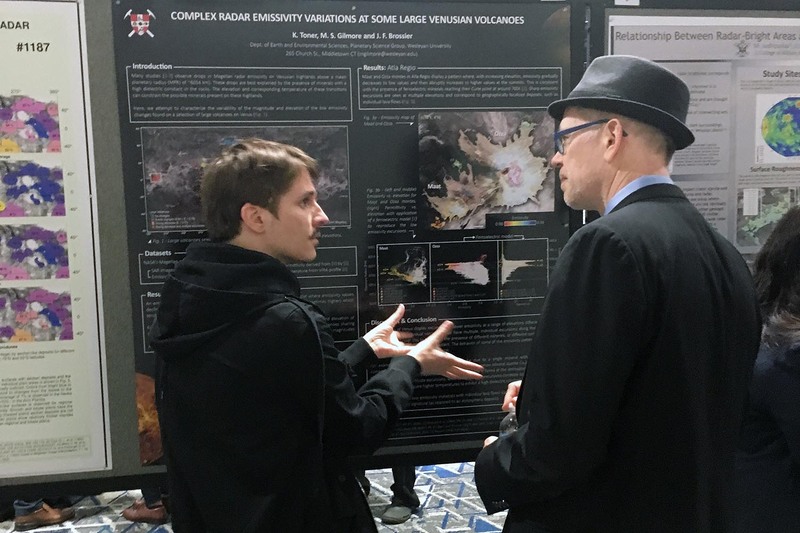 In addition to presenting research and attending talks, conference-goers also had the opportunity to learn about the newest NASA initiatives at the NASA briefing, as well as pick up stickers and posters during the poster session. Gilmore attended meetings with NASA personnel regarding Venus mission planning. 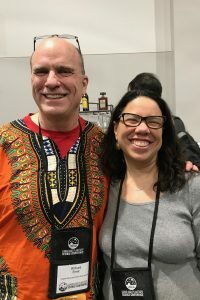 Haikus and poems about presented research are a popular element of LPSC, and poems about both Perkins’s and Gilmore’s research were written and posted on Twitter by Zachary Burton of the Twitter handle @PlanetaryPoetry. “A microwave emissivity story: Venusian version. In emissivities of tesserae. What is it? Emmy Hughes ’20 and Peter Martin ’14 pose near Hughes’s poster on ridges on Mars. Postdoc Jeremy Brossier presents his talk on Venus plateaus and volcanic rises. 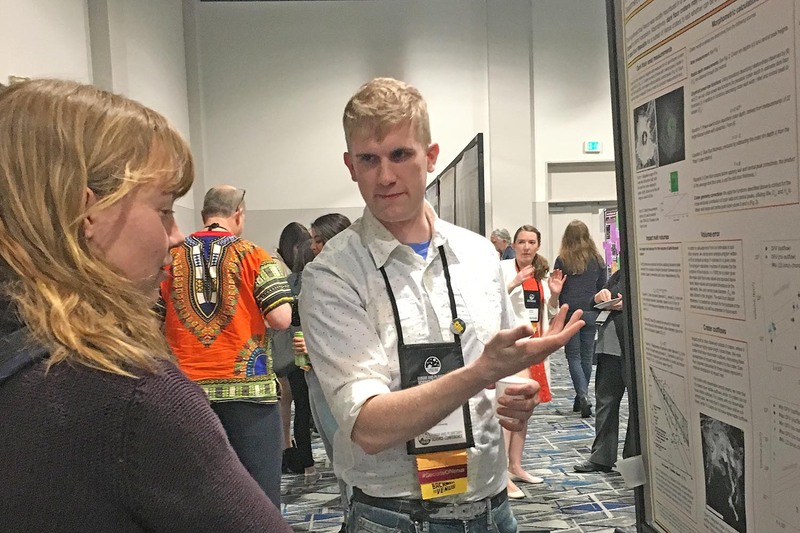 Reid Perkins MA ’19 presents research on Venusian tessera. Pictured left to right are Martha Gilmore; Ben McKeeby MA ’17; Jordyn-Marie Dudley MA ’18; Kristen Luchsinger MA ’17; Peter Martin ’14; Miché Aaron ’14; James Greenwood; Keenan Golder MA ’13; Emmy Hughes ’20; Reid Perkins MA ’19; Jeremy Brossier; and Jesse Tarnas ’16.